After spending a year helping to clean and catalogue the collection’s thousands of negatives, project volunteer Barbara finally found herself in a school photograph at our Salford Museum and Art Gallery Exhibition. As a child she went to St. Lawrence’s School and this photograph shows her on the front row (arms crossed, second from the left). 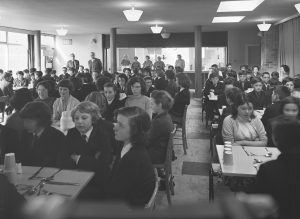 The photograph was taken in March 1964 in the school canteen. See more of our Salford Schools collection here. Posted in News, Volunteering by Gail on December 17th, 2016.